From Goodreads ~ There are more historical newspaper resources than you think - and they're easier to access than you know. When researched properly, no other type of record can beat historical newspapers in "taking the pulse" of their times and places, recording not just the names, but also information important to the community. This comprehensive how-to guide will show you how to harvest the "social media" of centuries past to learn about your ancestors and the times and places they lived in. 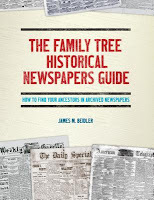 With step-by-step examples, case studies, templates, worksheets, and screenshots, this book shows you what you can find in online (and offline) historical newspapers, from city dailies to weekly community papers to foreign-language gazetteers. I track my family tree on Ancestry and books like this always interest me. 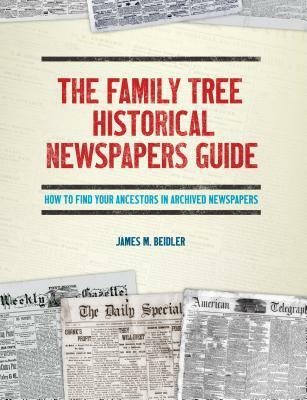 This one focuses on finding information about your ancestors through newspapers. Surprisingly there were a lot more pages and information than I was expecting. Throughout the book there are photo examples of articles, obituaries, notices (birth, marriage announcements, death and divorces), etc. from various newspapers from different times. There are also worksheets you can use to record your information along with many links which take you to the sources described. Though it's geared towards American sources (I'm in Canada), my father's family and my maternal grandmother's family were from the States so I'll probably find these sources helpful.